Kentucky ranks 17th in the nation for household food insecurity, according to Feeding America Kentucky’s Heartland, a local charity. In West Louisville, where nearly half of residents live in poverty, a nonprofit developer is hoping to change that with the help of some high-profile architects. 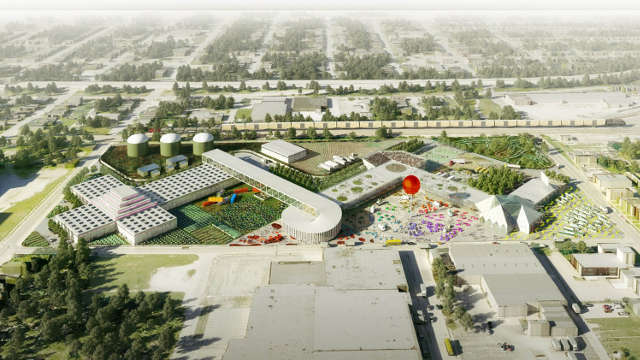 Seed Capital Kentucky’s plan is an OMA-designed “Food Hub” on an abandoned plot of land once used to cut and dry tobacco. Mayor Greg Fischer last year gave them a 24-acre vacant parcel of land in the West End worth $1.2 million for the project, which he called “a green job-generating machine for west Louisville.” The project could create about 250 permanent jobs and 270 construction jobs, according to the Louisville Courier-Journal. WDRB first reported last week that the hub’s designers include OMA and local firm GBBN Architects. The Fox affiliate reported Seed Capital Kentucky is $1 million into their $20 million fundraising goal, seeking $46 million in total, including future fundraising phases. That money would go to several programs, including a food bank, retailers, and a biodigester that turns organic waste into heat and energy. So far four organizations are formally on board: KHI Foods, Jefferson County Cooperative Extension, Star Distributed Energy, and the Weekly Juicery. The site, at South 30th Street between Muhammad Ali Boulevard and Market Street, is in a USDA-certified food desert. Seed Capital Kentucky founder Stephen Reily hopes the Food Hub will help alleviate hunger and stoke investment in the neighborhood. 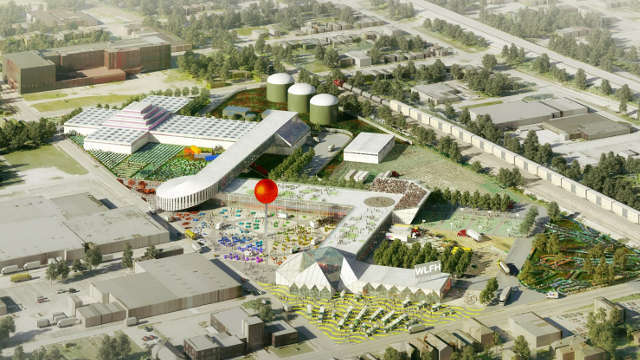 “Our vision for this project is one that collapses a lot of those middle men and transactions into one place where they can all work together to help create more fresh, regional food and help our region feed itself more sustainably,” he told WDRB.